Getting cat kids to use their litter box consistently can be a challenge. There are many reasons why your cat kids may be reluctant to use their litter box, but Naturally Fresh Herbal Attraction® Cat Litter was made with them in mind. Formulated with a blend of naturally scented herbs that have been shown to be extremely effective in attracting cats back to their litter box, our Herbal Attraction® formula is a calming, natural solution. Get superior odor control, experience three times better absorption than clay litter, and breathe easy with virtually no dust, all while attracting your cat kids to their litter box. Available in 14 lb. bags. An exclusive cat litter formula made from the fibrous material of the walnut shell, Naturally Fresh neutralizes litter box odors better than clay, pine, corn, and wheat litters. 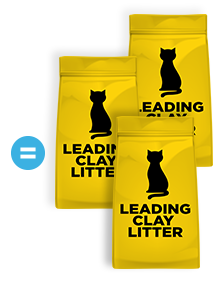 One bag of Naturally Fresh is equal to three bags of the leading clay litter. Our super-absorbent formula produces tight clumps in as little as 15 minutes, making cleanup easy and mess-free. Unlike clay litters that throw off silica dust, Naturally Fresh is virtually dust-free so you and your cat kid can breathe easy. It also doesn’t stick to your cat’s paws, so litter won’t be tracked through your place. All natural and annually renewable. 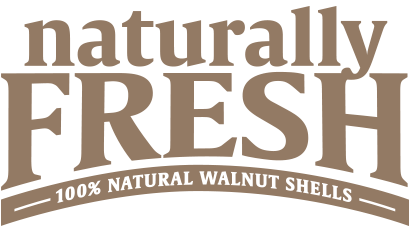 All natural and 100% biodegradable, Naturally Fresh is made from walnut shells, an annually renewable, non-food agricultural product. Made without any harmful ingredients, Naturally Fresh is safe for you, your cat kid, and the environment. Fill a clean litter box to the recommended level of three inches of Naturally Fresh Herbal Attraction® Cat Litter. This quick-clumping formula forms an easily removable clump of waste when wet. Remove with a scoop and discard according to your local regulations. Maintain cleanliness by removing clumps and solid waste daily. Add more litter, as needed, to stay at the recommended level of three inches. It is recommended that you clean and sanitize your litter box every 30 days to keep a fresh and healthy litter box for your cat kid. 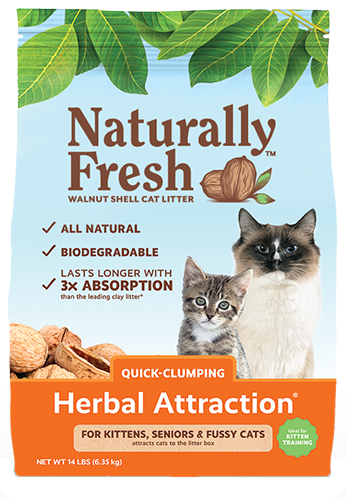 Based on a single-cat household, Naturally Fresh Herbal Attraction® Litter should last at least 30 days between changes, or as needed, for odor control. Start by placing one to two inches of Naturally Fresh Herbal Attraction® Litter in a clean litter box. Top dress with enough of your current cat litter to cover Naturally Fresh Herbal Attraction® Litter. It typically takes one or two changes for most cats to be comfortable with a new litter. Note: Wash hands thoroughly after handling used cat litter. Cat feces may carry parasites that can cause toxoplasmosis. Pregnant women and people with suppressed immune systems should avoid contact with used cat litter. * In separate independent studies, Naturally Fresh Quick-Clumping, Multi-Cat Quick-Clumping, Scented Multi-Cat Quick-Clumping, Herbal Attraction Quick-Clumping, Ultra Odor Control Multi-Cat, and Kitten Training litters were found to: (i) have a liquid absorption capacity at least three times greater per ounce than the leading clay-based litter; (ii) control ammonia odors better than the leading clumping litters; and (iii) form harder clumps than the leading pine, corn, and wheat clumping cat litters.